The “Scythia” docked in Quebec, not Halifax. This meant that the immigration official spoke French, not English, but not French as I knew it. It was a strange dialect I had trouble understanding. The process was brief; I answered a few questions (my mother still had problems with French), and we boarded the train for Montreal. This occurred late in the evening, and I have no recollections of the trip. It was dark, and only occasionally did we see any lights or habitations as the train rushed across the level plain, but we arrived in Montreal, and boarded another train, this one to New York City. While I can’t recall the scenery of Canada, both because it was dark, and possibly because there wasn’t any, once we were in New York and the sun came up I recognized in myself one of my old fears. It was triggered by the Levittowns which streamed by as we traveled southward. I was dreadfully afraid that our ultimate destination would be one of these communities where all the houses looked exactly alike, and more like military barracks than the homes they were meant to resemble. The feeling all this recalled was my walk with my mother to the Couvent St.Joseph, when as we passed one building or wall after another, I was afraid that this would be it, that this would be my new home, until we did get to our destination, and it wasn’t any different from any of the other possibilities I had dreaded. But no, in this case we chugged on to New York City. Just before we reached our destination, a Black porter in a white jacket offered us a choice of sandwiches, and I picked a ham and cheese (with mayo and lettuce) sandwich wrapped in some kind of soft, sheer plastic. It was incredibly delicious! I loved each of its components, including the white bread, and savored every bite. Amazing how tastes can change! When we finally arrived, the train station was incredibly crowded with streams of people rushing in every direction, and naturally enough, we joined them. Luggage wasn’t a problem, as we had very little. My mother seemed to know where we were going, and I just followed her. Where we were was the Main Concourse of Grand Central Station in the middle of the morning rush hour! I had never seen anything like it. It was a huge room, with a ceiling so high I could barely make it out! And there were thousands of people going in every which directions. 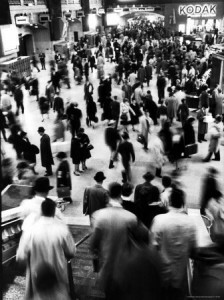 There were commuters and cops and shoe shine men, and newspaper boys, men and women of every size and color talking, shopping, hurrying, each to his own destination. For the first time I saw many African Americans. In Belgium, in the eleven years I had lived there, I had seen one! The only thing I could compare it to at all was a market in the Baghdad or Alexandria of my imagination, as I had read about them in some of my books. It was overwhelming! My mother moved us to a particular clock on the Concourse, and we began our wait to meet our sponsors, the sponsors who were going to lead and protect us in our new lives in America. Grand Central Station during rush hour was our introduction to our new lives in America. Were there any special formalities at the US-Canadian border in those days ? I suppose that you paperwork explained everything. This is a great story. I cannot wait for the next installment. Not that I remember. Even many years later you could cross the Canadian-US border in either direction without passport or any questions being asked.